DO YOU WANT TO ACHIEVE SPECTACULAR BUSINESS SUCCESS? Do you feel you have hit a ceiling and can’t get any better or higher? Are you trying to make more money and feel that something is holding you back but you can’t put your finger on it? Are you achieving limited business success and wondering why? Are you smart but unsuccessful in business? Are you full of great ideas but unable to monetize them? Do you have pedigreed credentials but unsuccessful in business? Do you have an MBA but unsuccessful in business? Are you one of the 20 million solopreneurs struggling in your own business? Let’s take a look at what may be impeding your business success. Firstly, success is often predicted by experts and pundits based on what you possess (your strengths and assets) and failure is predicted by the lack of those. Few people predict failure based on what you have that could impede or guarantee your failure – I label them as ‘bad ingredients' and 'wrong ingredients’. Those ingredients can make it difficult for you to achieve business success. For example, if your passion is be a great engineer (but not a business person), you have the wrong kind of desire to succeed in business. Secondly, the success factors generally considered are external ones like lack of business education, capital, technology, team, location, etc. Those may be your impediments but few people look at the internal factors – those inside your head. If you believe businesses plunder society and money is the root cause of evil, your subconscious brain (which makes 60%-80% of all decisions) will hold you back in business and in making money. You have negative views about being in business and about businesses. Such negative views manifest themselves as beliefs, rules and emotions. For example, if you heard that "Businesses plunder society" repeatedly and perhaps had negative experience that 'confirmed' that view, you will have developed a negative relationship with businesses as well as being in business. When you seek to start or grow a business, you are ‘wired’ and programmed’ to sabotage your own business success. Your subconscious (where your rules and beliefs manifest themselves) will 'prevent' you from succeeding in business. People with this issue may say, "Business is not for my kind of person." On the other hand, a successful business person might say, "I love being in business." You have negative views about money and making money. Such negative views manifest themselves as beliefs, rules and emotions. If you believe that money is the root cause of all evil or pursuing money making is a sinful activity, you are ‘wired’ and 'programmed’ to sabotage your own ability to make money. On the other hand, a person with a positive view of making money may say, "I love making money." Your true professional passion lies in a different career – what you enjoy doing, good at doing and truly want to do. In that case, you will not enjoy being in business, adequately prepare to be good at it or want to be in business. If you always have your finger on the 'escape button', you are constantly sabotaging your business success. On the other hand, a person whose 'true north' is being a business person will say, "I was born to be in business." You are unwilling to leave your 'comfort zone'. This is simply that while you may say you want to be in business and make money (lots of it! ), you are unwilling to leave what is comfortable for you - your present. Comfort zones are boundaries designed by us for personal safety and comfort. Most people have difficulty leaving their comfort zones (inertia) or even widening it. Unless you are an accomplished business person (usually experienced), it is highly unlikely that you will succeed without stretching and leaving your comfort zone. You have a low desire to be in business or achieve higher success in business. If you do not have a strong desire to be in business (I do it only for the money, It was just handed to me or I’d rather be doing X), your heart will not be in business and that will show in your (level of) business success. A person with a strong desire to be in business might say, "I am in business 24 hours a day." You have weak motivations – internal and external – for wanting business success or greater business success. Everybody in life has ups and downs, good days and bad days. If you don't have or can't find the motivation to persevere, setbacks could derail or destroy your business success. A person with strong motivations to pursue business success may say, "I will not stop until I build my business into a billion dollar company." Motivations are not the same as desire - motivations are what 'push' you, desires are what 'pull' you. You have 'success phobia' - the fear of success. Business is a game of constant battles which requires you to push for the win and sometimes defeat a competitor. If you have one part wanting and another fearing business success, you will be constantly sabotaging your business success. On the other hand, a person who pursues success and does not fear it might say, "I love to win in everything I compete." I call these seven bad ingredients as ‘business reluctance’. If you have business reluctance, it doesn’t matter what degrees you have, how smart you are or how much capital you have. You will have to overcome the ‘bad ingredients’ in order to achieve business success. No one will do something that they don’t want to do; at least, not for long. If you want to become a fighter pilot, you have to have certain qualifications. Additionally, you must not have certain attributes because they can lead to failure – bad eyesight, poor hearing, lack of desire to be a pilot, negative views about bombing, a burning desire to be an engineer(not a pilot), etc. Pilot applicants get rigorously screened but people wanting to get into business are not. People with any of the external ingredients for business – an idea, credentials, capital, technology, etc. – can start a business and run it for a while. Of course, bad or missing ingredients for business success will destroy the business but not before countless hours and capital have been lost. Reluctance is synonymous with resistance, an inability to act, make sluggish progress or outright inertia (failure to even get started). In business, you cannot afford to have business reluctance whether you are a CEO, executive, solopreneur, entrepreneur or somebody considering a business career. Remember the old saying that you can fool some people all the time and all people some of the time but not all people all of the time? I have an extension of that in business. If you have business reluctance and fail to achieve business success you could be trying to fool yourself all of the time. That will only result in mediocre results or failure all the time. If you have business reluctance and fail to acknowledge and conquer it, it can impede your personal success and that of your business. Keeping up appearances and failing to acknowledge and seek help can be fatal. Many people would rather fail than let somebody else find out they need help. It is only the smart ones that recognize their gaps, seek help and go on to achieve greater business success. “Be yourself; no base imitator of another, but your best self. There is something which you can do better than another. 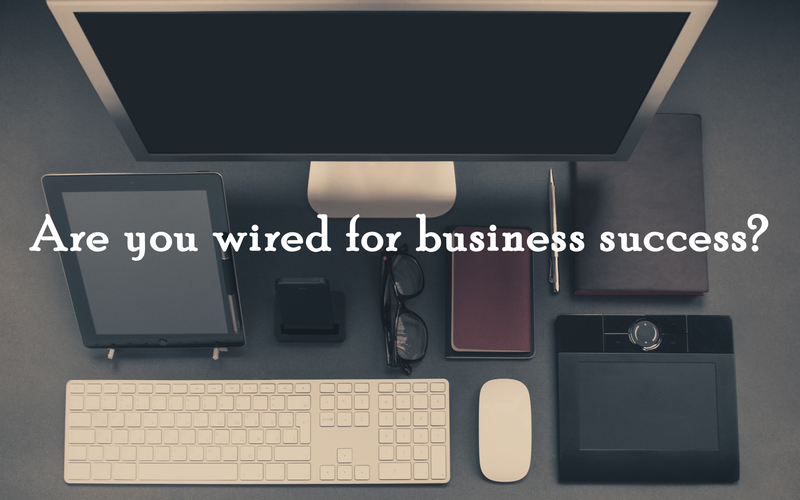 Go take the quiz and see if you are ‘wired’ for business success. If you want to work with a coach who can help you change your Business Reluctance into Business Enthusiasm, visit our Services Referrals page where you will find a list of screened coaches who specialize in this. If you want to read some books on the topics covered in this post, you can find a few recommended books under 'Business Reluctance' at http://businessthinking.com/knowledge/books. Ram V. Iyer is the President of the Business Thinking Institute in Princeton. He is on a quest to identify and share the key success factors in business so more people will be successful in business, increasing the number of successful businesses and raising the standard of living of millions across the world.